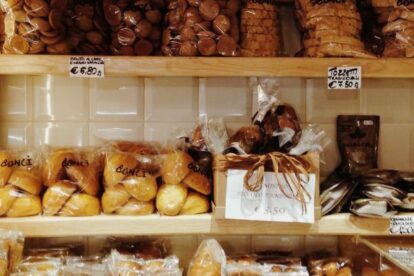 Well known as “the king of pizza”, Gabriele Bonci is the best baker in town and his bakery in the Prati neighbourhood deserves a visit. I go there to buy slices of (delicious) pizza as well as croissants, biscuits, bread and other baked products. It is not cheap, but it is definitely worth the money! His pizzas are never obvious: the combination of ingredients is always unusual and very tasty and everyday you can find a different one (he claims to serve 1500 different pizzas per year!). Besides Gabriele Bonci’s craftsmanship, this place also uses some of the best ingredients, such as organic, stone-ground flours, natural yeast-base (not just one, but at least seven different ones), organic vegetables from his own allotments and local products furnishing his well-known pizza by the slice, which is at the same time soft and crunchy…just perfect! The bakery is very small, so be prepared to wait for your turn, especially at rush hours… but it will be worth it!